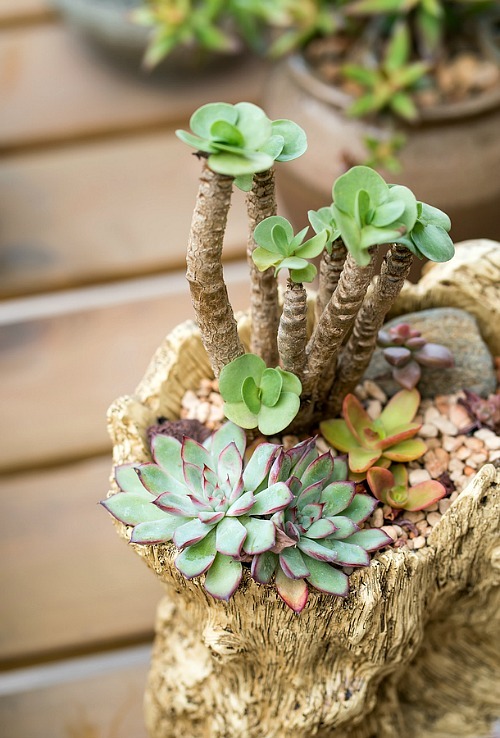 Succulents are a low maintenance plant, which makes them perfect for brown thumbs, but green thumbs love them too! They are so dramatic and eye catching with a massive variety of colors, textures, and shapes. They are perfect for containers, adorable in fairy gardens, and will grow just about anywhere you want to put them. Plus, they’re pretty inexpensive, making them a frugal houseplant choice, and a frugal way to add to your yard’s landscaping. 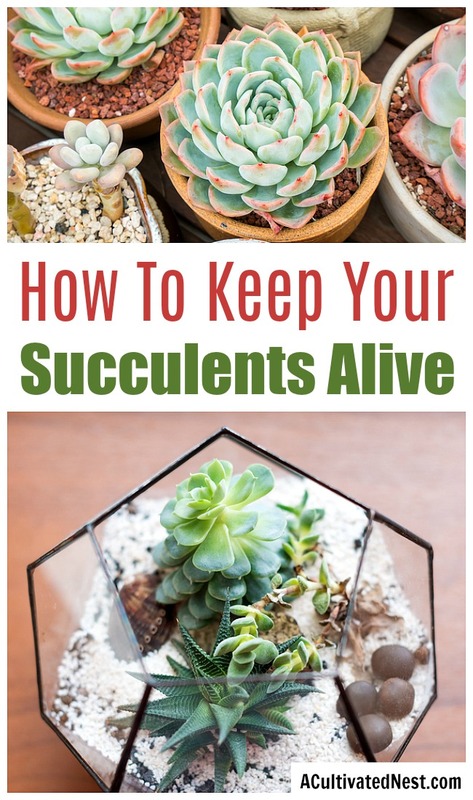 If you’d like to get a bunch of succulents of your own, then you should first read my tips on How To Keep Your Succulents Alive! 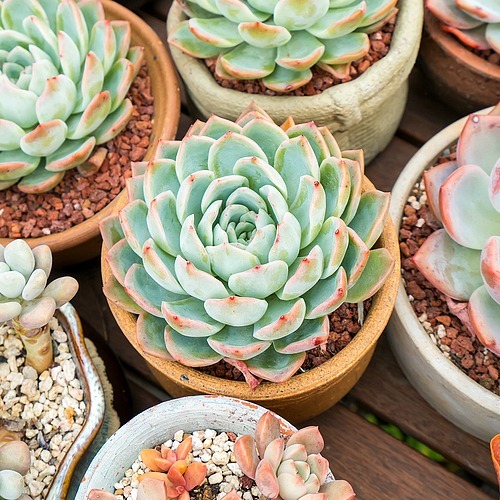 Caring for succulents is pretty easy, but knowing the clever tips in this beginner’s guide to succulents will ensure that your succulents thrive! If you want to keep your succulents alive, you will want to plant them in a well draining soil. The best soil for succulent beginners is any cactus/succulent potting mix that you can pick up at your local nursery or on Amazon. Once you get more experienced at caring for succulents you may want to mix up your own soil, but for now stick with pre-made mixes. In nature, succulents are found in arid, dry environments full of sun, but low on water. So to keep your succulents healthy, you’ll want to give them enough sun. Otherwise they may become leggy (growing very tall with sparse leaves, almost looking stretched out as they reach up trying to find sunlight). Succulents prefer about 4-6 hours of direct sunlight per day. If your succulent gets too much sun it may start to lose color. Yes, you do have to water succulents! If you hope to keep your succulents healthy, you’ll want to water them occasionally (though they are drought resistant, so a few skipped waterings won’t kill them). When you water then, water well, but allow the soil to dry out completely between waterings. Succulents do not need (or like!) constantly damp soil. Indoors you will definitely need to keep a close eye on the soil as heat and air conditioning may dry them out quicker than you may expect. Also be sure that the containers you put your succulents in have good drainage so the succulents don’t sit in water for too long. Succulents need more water when they’re growing. While many succulents won’t die in the extreme heat or cold, they won’t grow either. So you need to pay attention to your local temperatures and your plants to determine when they have stopped and started growing for the year. In general, succulents need the most water during the summer. Larger plants need more water, as do pots with multiple succulents growing in them. If you want to keep your succulents alive, then you also need to watch out for bugs and fungi! Many people think that because they’re so hardy, succulents are impervious to disease or to being bothered by insects. But fungal diseases like fusarium wilt, grey mold, and root rot can really damage your succulents, as can outdoor pests like snails, aphids, and slugs. 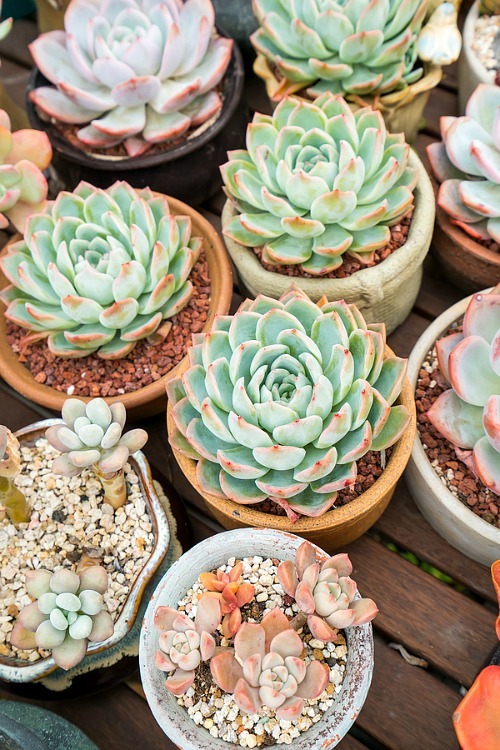 Fungi can often be avoided by using the right soil with proper drainage, and your typical anti-pest methods can keep your succulents free of bugs. Sometimes you may want to trim back an overgrown succulent, or maybe you just want to frugally grow your own little succulent collection. This is when it’s time to propagate! Luckily propagating succulents is very easy. It’s especially easy to propagate the succulent variety called Hens and Chicks. But regardless of what variety you’re growing, you will still need to follow a few tips to yield the best results. If you are pruning back an overgrown plant or propagating a new one you should cut off the top, making a good cut, not tearing the stem. Pull off the succulent leaves gently, removing the entire leaf from the stem by working it side to side until it comes off. The next thing you need to do is lay your plant top and leaves out and let the ends dry up completely- no soil, no water. Once the ends have “scabbed” over, lay the leaves gently on top of a dish of cactus soil. It takes a couple weeks, and just a few spritzes with water in a spray bottle, but you will begin to see tiny little pink roots and baby succulent plants beginning to form off the end of your leaves. If you cut off the top of your plant you can also push the end of it into cactus soil to begin a new plant. When the new plants have begun to grow you should spray the leaves lightly with water daily, or dampen the soil every few days. As your original leaf begins to whither you can remove the new growth or let it fall off naturally. Transfer your new little sprouts to their own containers. Once you know how to keep your succulents alive, you can move onto a more fun problem- deciding how to display your succulents! 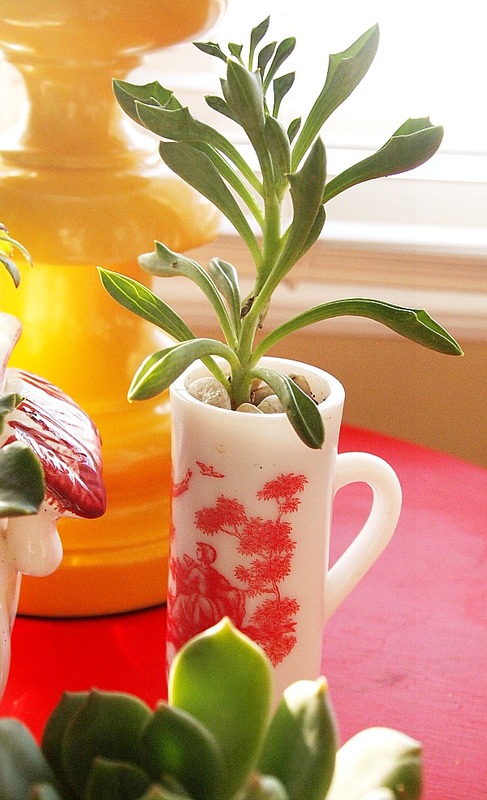 Get creative when you plant or pot your succulents! They are beautiful in the most unusual of containers. Create an arrangement in the back section of a child’s old toy truck, pop some inside a large glass cookie jar to make a terrarium for indoors, plant them in a hollowed out log in your garden, stick them out of the many holes in a strawberry pot, or create a terrarium (like the pretty one above- you can find a similar type of terrarium on Amazon). There are tons of creative, beautiful possibilities! 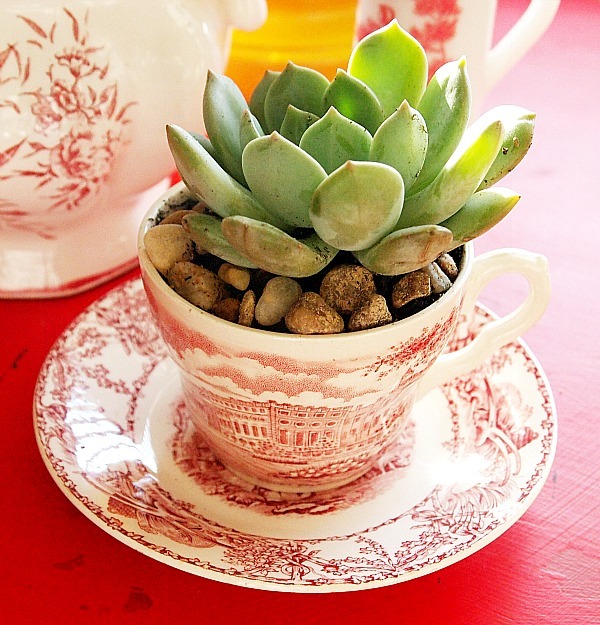 You might find some inspiration in my post on pretty ways to decorate with succulents. In general, regardless of what you choose to use as a planter, you need these things to provide the optimal environment for your indoor succulent garden- your cactus/succulent potting soil, tiny rocks (to add drainage), sphagnum moss (to control moisture and reduce bacteria), and a few succulents (try contrasting shapes/colors!). Place the rocks at the bottom of your planter, then the moss, and top it off with the potting soil. If you’re building a succulent terrarium, you may also want to add horticultural charcoal between the rocks and moss to ensure the succulents stay healthy. You might also want to add some cute decorative elements to your indoor succulent garden, like the kind used to decorate fairy gardens! Hens And Chicks- As I mentioned earlier, Hens and Chicks is a popular succulent variety because it’s so easy to propagate. It also has a classic radial succulent look that makes it fun to decorate with! Plus, it can survive in very hot or very cold temperatures (though at extreme temperatures it’s dormant and not growing), which means it can be grown outside without any worry! Pinwheel Desert Rose- While most succulents love hot temperatures, the Pinwheel Desert Rose thrives at room temperature (65-75°F), making them the perfect succulent for beginners! Burro’s Tail- The pretty Burro’s Tail succulent grows in long, trailing stems that make it perfect for hanging baskets! Baby Toes- The cute Baby Toes succulent derives it’s name from the stubby, tubular leaves that it grows. It’s a unique, cute kind of succulent, and it grows pretty flowers in the summer! Zebra Plant- I love the unique coloring of the Zebra Plant succulent! This is a spiky kind of succulent, that can make a great decorating statement if paired with the right pot! Note: I’ve never tried it, but many people have had good experiences buying live succulents on Amazon. This could be an easy way to find common and exotic succulent varieties if your local nursery doesn’t have a good selection. 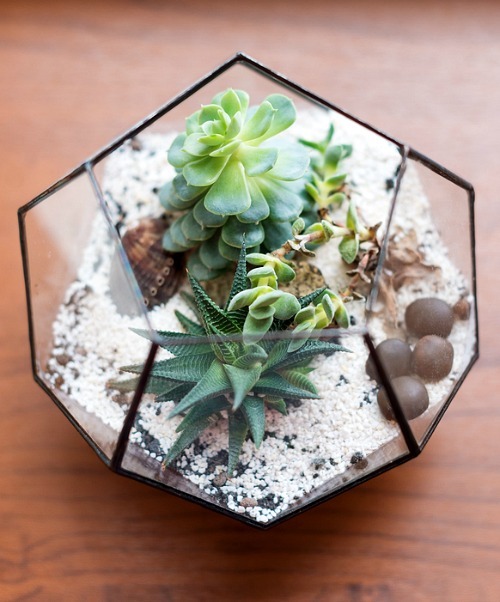 Now you know everything necessary to keep your succulents alive and thriving! What kinds of succulents do you want to grow? Do you have a fun planter idea for them?